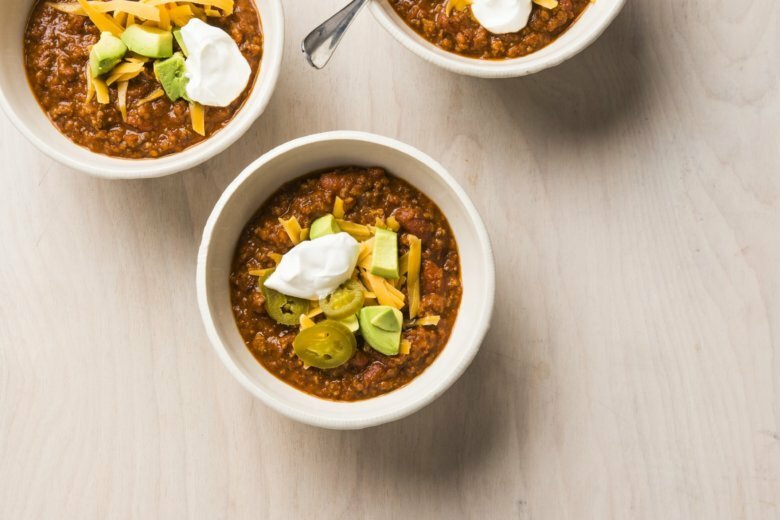 Great chili should have bold, long-simmered flavor, even if it’s made with convenient ground beef. The multicooker was the perfect way to achieve this with a minimum of hands-on time. A combination of chili powder, cumin, and garlic was all we needed to give the chili great spice flavor. We used crushed tomatoes plus chicken broth for a base with the proper consistency. Browning the beef is standard in many chili recipes, but we found that the browned meat overcooked easily in either the intense heat of the pressure cooker or the prolonged heat of the slow cooker. To avoid this, we mixed it with a panade (a mixture of bread and milk) to help it stay moist, and sauteed the meat just until it lost its pink color. Serve with your favorite chili garnishes. Mash bread, milk, 1/2 teaspoon salt, and 1/2 teaspoon pepper into paste in large bowl using fork. Add ground beef and knead with hands until well combined. Using highest saute or browning function, heat oil in multi-cooker until shimmering. Add onion and 1/4 teaspoon salt and cook until onion is softened, about 5 minutes. Stir in chili powder, cumin, and garlic and cook until fragrant, about 30 seconds. Add beef mixture and cook, breaking up meat with wooden spoon, until no longer pink, about 4 minutes. Stir in broth, scraping up any browned bits, then stir in beans and tomatoes. — To pressure cook: Lock lid in place and close pressure release valve. Select high pressure cook function and cook for 10 minutes. Turn off multicooker and quick-release pressure. Carefully remove lid, allowing steam to escape away from you. — To slow cook: Lock lid in place and open pressure release valve. Select low slow cook function and cook until flavors meld, 3 to 4 hours. Turn off multicooker and carefully remove lid, allowing steam to escape away from you. Adjust chili consistency with extra hot broth as needed. Season with salt and pepper to taste. Serve. Be sure to use ground turkey, not ground turkey breast (also labeled 99 percent fat-free), in this recipe. Substitute 1 pound ground turkey for ground beef. Break turkey mixture into pieces no smaller than 1 inch when browning in step 2. Add 2 minced jalapeno chilies to multicooker with onions. Add 1/4 cup minced canned chipotle chili in adobo and 1 teaspoon cayenne pepper to multicooker with chili powder. Nutrition information per serving: 436 calories; 156 calories from fat; 17 g fat (5 g saturated; 1 g trans fats); 52 mg cholesterol; 824 mg sodium; 43 g carbohydrate; 14 g fiber; 6 g sugar; 29 g protein.